Maybe I have a “talkable” face but I have many encounters with strangers on a regular basis. I thought I’ll record the more interesting and endearing ones. I recently wrote about the Patrician from the class of 1957. This encounter falls under the endearing category. Two days ago, I had an early dinner at 115 Bukit Merah View Market and Hawker Centre. 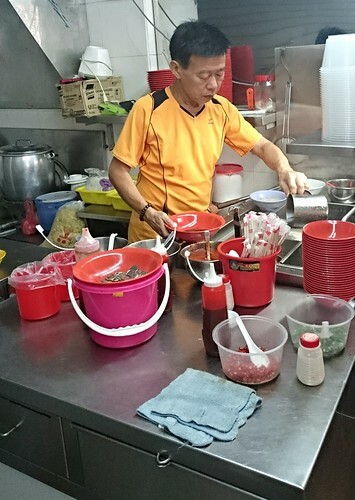 I had mee pok dry from this gentleman from Soon Heng Minced Meat Noodles stall. OK, but this post is not about him – just posted it coz I had a snap. After getting our bowls of noodles, we wanted to sit at the breezier side of the hawker centre (the car park side, on that day). However, most of the tables were not cleared. We found one relatively clean and empty table just next to a porridge stall called Shi Fu A1 Rou Zhou. Soon after we took our seats, this elderly lady who runs the porridge stall with her sister sat down on the same table in front of a pile of pei dan (century eggs) presumably to peel them in preparation for the dinner crowd. Sharing the same table, I naturally looked towards her, smiled and wished her Xin Nian Kuai Le (happy lunar new year in Mandarin). She beamed, thrilled. She could only converse in Hokkien. I can’t speak Hokkien. Through my dinner companion who interpreted for me, she readily revealed that she was in her seventies. 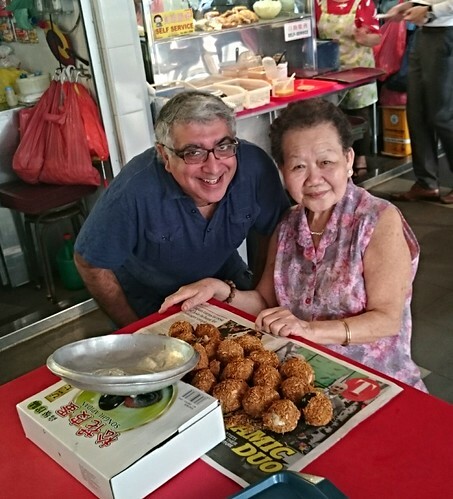 She started selling porridge in the same location around 1975 when she was in her thirties. Perhaps it was a simple smile or perhaps it was an Indian guy wishing her happy lunar new year in Mandarin (or a combination) that made her so happy. She claimed (unsubstantiated, I must add) that I am a “good person” because most people “ignore the elderly.” She said it’s the way I took the initiative to acknowledge her and the way I smiled at her. I was a bit pai seh when she added again that I’m a “good person”. She was animated, smily and jovial throughout the conversation. She happily posed for a picture with me. So sweet. She wished us Jing Bu (progress) many times. This is the funny bit. As we continued eating, she told my companion in Hokkien, “Don’t mind me, I’m an old person so it should be ok for me to say this. He is very good-looking.” She then again repeated that I’m a kind and good person. I’d by lying if I didn’t say that it made me feel good. I wish I could speak Hokkien. We could have had a longer conversation. Maybe I should learn some conversational Mandarin this year. See how. We promised to come back to eat. Bottom line is that we made each other’s evenings. Lesson learned – look at people and smile. It’s almost always a win-win. What a lovely evening. I’m still smiling as I write this.